DFRobot Gravity: Analog pH meter V2 is specifically designed to measure the pH of the solution and reflect the acidity or alkalinity. It is commonly used in various applications such as aquaponics, aquaculture, and environmental water testing. As an upgraded version of pH meter V1, this product greatly improves the precision and user experience. The onboard voltage regulator chip supports the wide voltage supply of 3.3~5.5V, which is compatible with 5V and 3.3V main control board. The output signal filtered by hardware has low jitter. The software library adopts the two-point calibration method, and can automatically identify two standard buffer solutions (4.0 and 7.0), so simple and convenient. 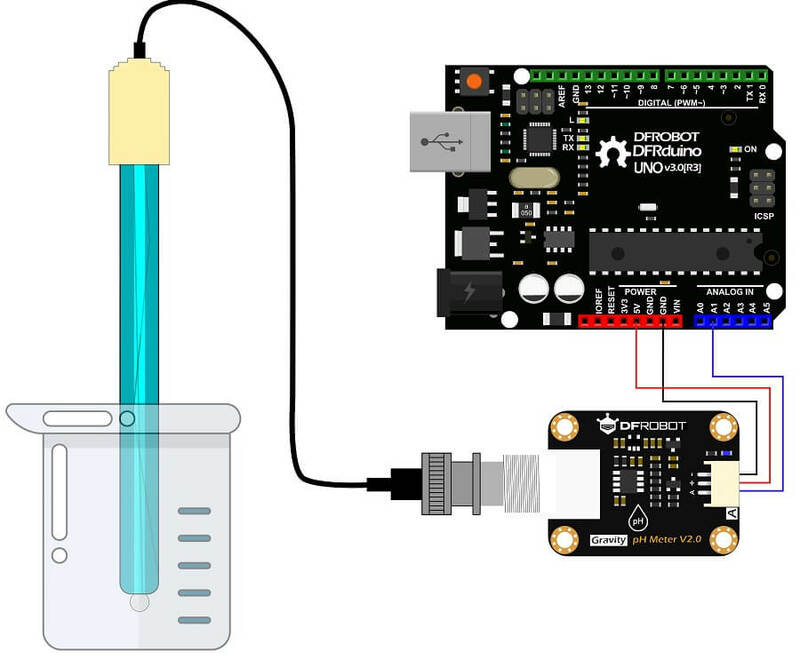 With this product, main control board (such as Arduino) and the software library, you can quickly build the pH meter, plug and play, no welding. The pH is a value that measures the acidity or alkalinity of the solution. It is also called the hydrogen ion concentration index. The pH is a scale of hydrogen ion activity in solution. The pH has a wide range of uses in medicine, chemistry, and agriculture. Usually, the pH is a number between 0 to 14. Under the thermodynamic standard conditions, pH=7, which means the solution is neutral; pH<7, which means the solution is acidic; pH>7, which means the solution is alkaline. 1. The BNC connector and the signal conversion board must be kept dry and clean, otherwise, it will affect the input impedance, resulting in an inaccurate measurement. If it is damp, it needs to be dried. 2. The signal conversion board cannot be directly placed on a wet or semiconductor surface, otherwise, it will affect the input impedance, resulting in the inaccurate measurement. It is recommended to use the nylon pillar to fix the signal conversion board, allow a certain distance between the signal conversion board and the surface. 3. The sensitive glass bubble in the head of the pH probe should avoid touching with the hard material. Any damage or scratches will cause the electrode to fail. 4. After completing the measurement, disconnect the pH probe from the signal conversion board. The pH probe should not be connected to the signal conversion board without the power supply for a long time.